April 2018 – Patrick’s paper describing the total synthesis of incargranine A has been published in OBC as part of a special “2019 New Talent” collection and is now available online. Congratulations Patrick! February 2018 – Dr Katherine Law has joined the group as a postdoctoral research fellow after spending two years working at the Herbicide Innovation Partnership between Bayer and the GRDC . Welcome to the group Katy! October 2017 – Jake has won the 4th Year School of Chemistry Class Medal. Congratulations Jake! September 2017 – Welcome to Helen (PhD), Jake (MChem), Maciej (MChemX) and Tomas (MChemX), the newest members of the Lawrence group! September 2017 – Andy has been awarded an ERC Starting Grant, which provides the group with substantial funding (€1.5 million) for the next five years. Informal enquiries are welcomed for associated postdoctoral positions, which will be advertised soon. September 2017 – Patrick’s review on the importance of biosynthetic considerations during the structure elucidation of complex natural products is now avialble online at Natural Product Reports. August 2017 – Farewell to Ioanna Nakou who has spent two months in the group as an MSc student, working on the total synthesis of a complex alkaloid. Excellent progress was made and I am confident this tricky molecule will be made in the group soon! Ioanna will be starting her PhD studies soon at the University of Warwick in the Challis Group. Thanks for the Greek gifts!! August 2017 – Farewell to Dr Nick Green and Dr Irene De Silvestro! Nick has completed his postdoctoral stay within the Lawrence group and is moving to the University of Cambridge to start a postdoctoral position in the Sutherland Group. Irene has completed her PhD and is off to the University of New South Wales in Australia to start a postdoctoral position in the Morris Group. Good luck guys, you will both be missed! July 2017 – Peter recently presented a poster at the 25th International Symposium; Synthesis in Organic Chemistry in Oxford. Well done Peter! July 2017 – Marie is competing for the Sparrho Early Career Researcher Prize. Marie has been interviewed and has produced a website for this prestigious prize. Good luck Marie! July 2017 – Nick and Marie recently presented posters at the 18th Tetrahedron Symposium in Budapest. Nick was awarded a prize for his poster Biomimetic Synthesis of Unnatural Products. Well done guys! June 2017 – Ioanna Nakou has joined the group to undertake an MSc research project focused on the biomimetic synthesis of a complex alkaloid. Welcome to the group Ioanna! June 2017 – Rob was awarded the prize for best poster in the synthesis and catalysis section at the Joseph Black Conference today. Well done Rob, great job! May 2017 – Irene has been awarded a grant by the organising scientific committee to attend and give an invited talk at the 4th International Workshop on Pericyclic Reactions and Synthesis of Hetero- and Carbocyclic Systems (Milan, 28th-30th June). May 2017 – Marie has been awarded an RSC Travel Grant to attend and present a poster at the 18th Tetrahedron Symposium (Budapest, 27th-30th June). May 2017 – Our most recent paper – “Total Synthesis of a Dimeric Thymol Derivative Isolated from Arnica sachalinensis” has been published in Angewandte Chemie International Edition as a Hot Paper, well done Irene and Sam! April 2017 – Our most recent paper – “Total Synthesis of (−)-Angiopterlactone B” has been published in Organic Letters, well done Marie! February 2017 – Catherine Connolly (current MChem student in the Lawrence group) has secured a Criticat CDT 2017 PhD studentship. Catherine will be working under the joint supervision of Andy and Prof. Dominic Campopiano (Campopiano group), investigating biomimetic chemistry and biocatalysis. November 2016 – Work from Marie’s time as an undergraduate, working with Dr. Iain Smellie at the University of St Andrews, has been published in the Journal of Chemical Education. Congratulations Marie! September 2016 – Koen and Catherine have joined the group to undertake undergraduate research projects. Welcome to the group! September 2016 – Patrick’s paper “Total Synthesis of Millingtonine” has been highlighted by Professor Erik Carreira in SYNFACTS! August 2016 – Irene and Nick represent the group by speaking at the 2016 New Zealand Institute of Chemistry Conference and the inaugural EaStCHEM Early Career Researcher Conference, respectively. Well done guys! June 2016 – Dr Nick Green from the research group of Prof. Mick Sherburn (ANU, Canberra) has joined the group as a postdoctoral research fellow. Welcome to the group! June 2016 – Graduation time! Patrick Brown (PhD), Connie Buettner (MChemX), Rhiann Ankers (MChem) and Duncan MacDonald (MChemX) have all graduated today. Congratulations guys! Rhiann won the “2016 Louis Cohen Prize” and Connie won the “2016 Forbes Prize”! June 2016 – Marie’s MChem project work with Dr. Gordon Florence at the University of St Andrews, entitled “Development of Simplified Heterocyclic Acetogenin Analogues as Potent and Selective Trypanosoma brucei Inhibitors” has been published in ChemMedChem. Congratulations Marie! June 2016 – Irene has been selected to give an oral presentation at the New Zealand Institute of Organic Chemistry Conference in Queenstown, NZ (August 21-24, 2016). Congratulations Irene! June 2016 – Marie and Peter presented their 1st year PhD posters at the Annual Organic Section Firbush Meeting. Both posters were very popular and Marie won a Prize for Best Poster. Congratulations guys! June 2016 – Rhiann Ankers has won the “Louis Cohen – 2016 MChem Project Prize”. That makes it two years in a row that a student from the Lawrence group has been awarded this prestigious prize. Congratulations Rhiann! June 2016 – The group welcomes back PhD students Irene De Silvestro and Peter Dabell, who have spent the last two months at the CSIR-NCL (Pune) on research placements. May 2016 – Many congratulations to Dr Patrick Brown for passing his PhD viva, with Prof. John Moses from the University of Nottingham as external examiner and Prof. Guy Lloyd-Jones FRS as internal examiner. April 2016 – Our most recent paper – “Total Synthesis of Millingtonine” has been accepted for publication in Angewandte Chemie International Edition, well done Patrick! 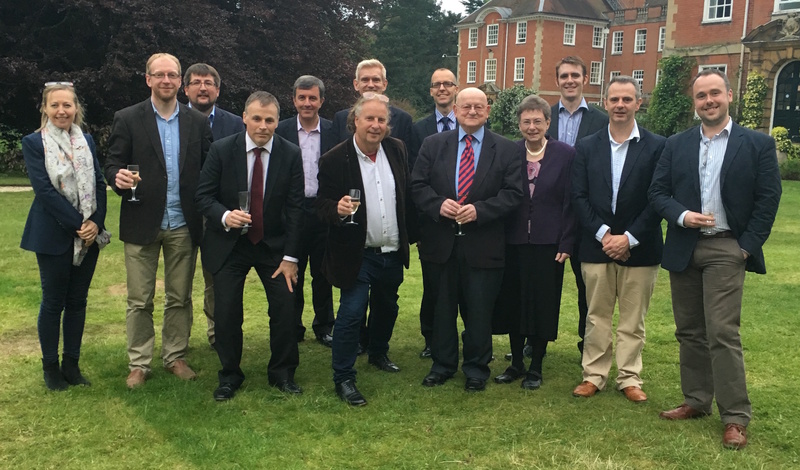 February 2016 – The group has been awarded an EPSRC First Grant. This grant will provide funding to investigate the gram-scale biomimetic synthesis of natural products with potent biological activities. Informal enquiries are welcomed for the associated postdoctoral position, which will be advertised formally in due course. December 2015 – Peter’s MChem project work with Professor John Walton at the University of St Andrews, entitled “Bicarbonate and Alkyl Carbonate Radicals: Their Structural Integrity and Reactions with Lipid Components” has been accepted for publication in the Journal of the American Chemical Society. Congratulations Peter! December 2015 – Andy has been named as a 2016 Thieme Chemistry Journal Awardee. These awards are given to individuals loosely defined as promising young professors at the beginning of their career. October 2015 – Rhiann, Connie and Duncan have joined the group to undertake undergraduate research projects. Welcome to the group! September 2015 – Marie Thomson has joined the group as a PhD student. Marie completed her MChem (with a year in industry at BASF, Germany) at the University of St Andrews in 2014 and has spent the last year traveling in South East Asia and Australia. Welcome to the group! September 2015 – Patrick has won the Prize for Best Talk at the 30th Heterocyclic & Synthesis Group Postgraduate Meeting (Lilly UK Research and Development, Windlesham) for his presentation “Biomimetic Synthesis of Dimeric Phenylethanoids”. Congratulations Patrick! July 2015 – Rebecca Burns has won the “Louis Cohen Endowment Prize” in recognition of the excellence of her MChem Honours research project that she completed within the Lawrence Group. Congratulations Rebecca! May 2015 – Irene was awarded the runner-up prize for her poster presentation at the Joseph Black Conference. Congratulations Irene! April 2015 – Our most recent paper “Unified Total Synthesis of the Natural Products Endiandric Acid A, Kingianic Acid E, and Kingianins A, D, and F” has been accepted for publication in Chemical Science. This paper represents the completion of a highly productive collaboration working with Prof Mick Sherburn (Sherburn Group). Congratulations Sam! April 2015 – Welcome to Peter Dabell who has joined the group as a Criticat CDT PhD student. Peter will be working under the joint supervision of Andy and Dr Stephen Thomas (Thomas Group). April 2015 – Patrick has won the Prize for Best Talk at the SCI Postgraduate Symposium on Novel Organic Chemistry (Strathclyde University) for his presentation “Biomimetic Synthesis of Phenylethanoid Alkaloids”. Congratulations Patrick! March 2015 – The group has been awarded a 2015 Royal Society Research Grant. December 2014 – Our most recent paper – “Total Synthesis of Ramonanins A-D” has been accepted for publication in Angewandte Chemie International Edition, well done Emily and Ross! October 2013 – Patrick’s work – “Total Synthesis and Structural Revision of the Alkaloid Incargranine B” has been accepted for publication in Angewandte Chemie International Edition, well done Patrick! October 2013 – The Lawrence Research Group will be moving to the University of Edinburgh in November 2013. July 2013 – Our synthesis of kingianins A, D and F has been highlighted in “Chemistry World” in Paul Docherty’s “Totally Synthetic” column. March 2013 – Sam’s work – “Total Synthesis of kingianins A, D and F” – has been accepted for publication in Angewandte Chemie International Edition, well done Sam! November 2012 – Patrick recently graduated and received a University Medal. Congratulations Patrick! Patrick will be commencing his PhD studies in the Lawrence Group in February 2013. October 2012 – Patrick’s paper “Total Synthesis of Incarviditone and Incarvilleatone” has been highlighted by Professor Erik Carreira in SYNFACTS!